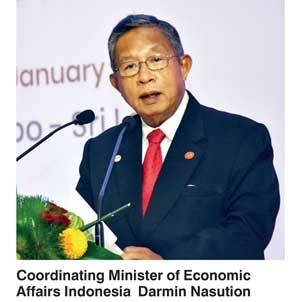 Optimistic on improving trade relations between the two countries, Indonesian Coordinating Minister of Economic Affairs Darmin Nasution yesterday called for a Free Trade Agreement to enhance economic ties. Nasution, part of the delegation accompanying Indonesian President Joko Widodo, who is on a three day visit to Sri Lanka, called for a joint feasibility study to understand the potential for the FTA. Speaking at the Sri Lanka-Indonesia Business Forum held at the Shangri-La Hotel, he highlighted that over the years the Indonesia–Sri Lanka bi-lateral trade has been steadily improving with a 12% increase recorded from 2016 to 2017. “We very much appreciate the investments by Sri Lankan investors which have also increased from 2016 to 2017 and encourage greater investments in the future. This data does not reflect the true potential of our economic cooperation,” he said. Indonesia views Sri Lanka as a potential economic partner in trade and investment, Nasution said, urging increased trade cooperation. There is also potential for cooperation in industrial sector to the cross regional Indonesian scheme of Tobacco and fabrics as well as investments in infrastructure. The country with one of the most politically stable and dynamic economies, Indonesia is also a production hub, a market and a hub to enter ASEAN market for Sri Lankan investors, the Coordinating Minister pointed out, inviting more engagement.